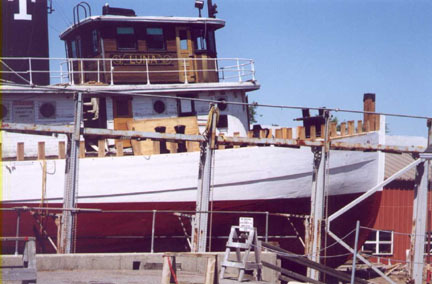 Awaiting Relaunch: The Luna is resting on the railway, about 90 minutes before the carriage was lowered back into the water. The hull below the waterline boot top has been coated with three coats of high copper content anti-fouling paint. The upper hull is primed with white primer and will be painted later. The stanchions can be seen rising above the main deck, awaiting construction of the bulwarks. The shadow along the bow is where the planking shifts from the four 4-inch thick broads to the general 3-inch thick planking below. The apron piece behind the stem rises proudly above the stem, awaiting shaping into the riding bitt. The cast iron quarter bitt along the deckhouse and the H-bitt on the bow are now bolted to the deck. The Shipyard Crew: The Samples shipyard crew assembled on the railway platform just prior to returning the Luna to the water. 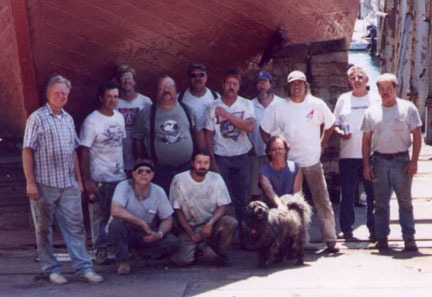 Far left is Joe Jackimovicz, shipyard foreman, and second from right is Bob Braga, Shipyard President. The shipyard crew consisted of three master shipwrights, carpenters, a machinist, and various helpers. They are all doing a great job for the Luna. Midnight the dog is the loyal helper of Tony Finocchiaro, one of the master shipwrights and has been on the project with Tony throughout. Moving Down to the Sea: As the railway cradle was slowly lowered by the electric motor and its gearing, the chains groaned as the 315-ton tug was slowly moved toward the water. Here the full tug can be seen. The water is beginning to creep up the keel blocks towards the keel. enlarge The Stern: The propeller, its supporting frame, and the rudder can be seen in this photo. 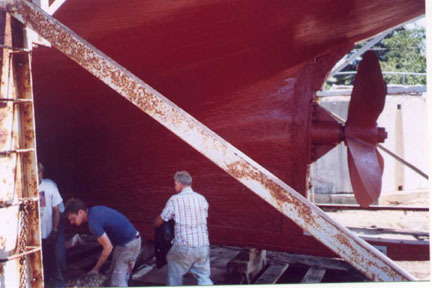 While the hull received three coats of anti-fouling paint on top of a coat of red-lead primer, the steel was blasted and cleaned, and then coated with a base of two coats of epoxy paint. 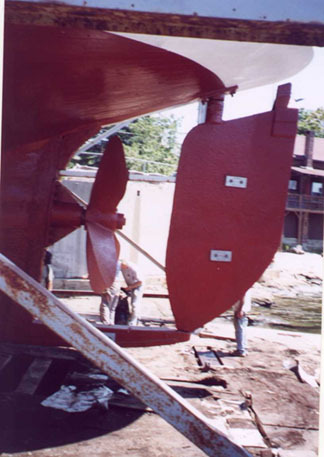 The sacrificial zinc anodes are bolted to the rudder and the propeller shoe at the bottom. The propeller shaft is supported by a large weldment that is bolted to the vertical stern post. The rudder stock can also be seen. enlarge The Stern Area: Before the railway was lowered, the carriage was a beehive of activity: the supporting structure was taken down and broken up for removal, the final round of sweep up picked up sawdust, spikes, old trunnels, etc., and the scaffolding was taken down all around the tug. 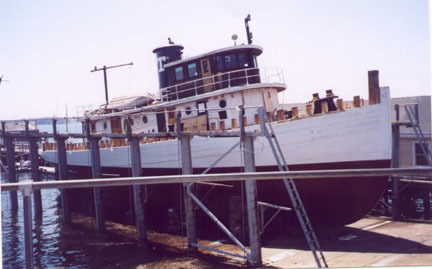 Here the planking of the tug in the stern area can be seen, smooth, caulked, and painted.